The heat stress meter PCE-WB 20 SD is designed to capture WBGT-values, the Black-Globe Temperature, humidity, air temperature, wet-bulb temperature, and the dew point temperature indoors as well as outside. The heat stress meter PCE-WB 20 SD has been developed for an objective rating of working places under extreme weather conditions. Objective criteria for the determination of an adequate level for physical activity outdoors can be valuable in industrial environments, since clear standards assure relevant actions. The US military developed the WBGT as a basic for their training camps, but since then the WBGT principle has been extended to work places and sports activity locations. The WBGT index is useful to develop guidelines for work breaks and limitations or preventions of intense activity. At the heat stress meter there can be read temperature and dew point values that can be stored onto a memory SD card. In case the conditions change, an acoustic alarm goes off. 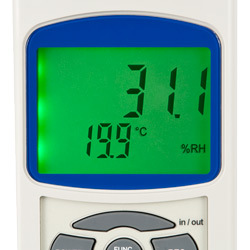 By means of the heat stress meter PCE-WB 20 SD there can be documented up to 99 values in real time automatically in an interval of 1 ... 3600 seconds or manually by pressing a button. This allows measuring values and a distinct time and storing them as evidence of the environmental conditions. By means of the SD memory card the stored data can be transferred to a computer and indicated in a spreadsheet. 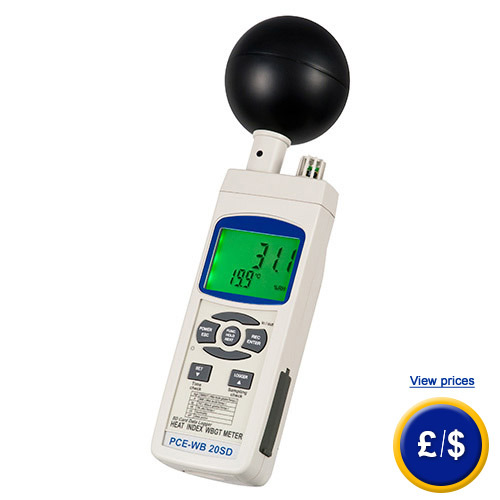 If there are any questions about this heat stress meter PCE-WB 20 SD, please have a look at the technical specification below or call: UK customers +44(0) 23 809 870 30 / US customers +1-410-387-7703. Our technicians and engineers will gladly advise you in all climate meters and all products in the field of measuring instruments, regulation and control and scales. 5 ... 95 % R.H.